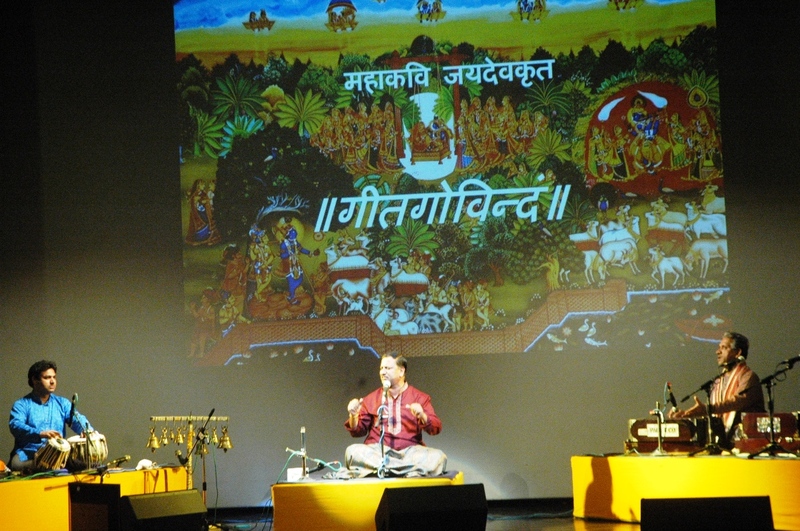 The 2 day Malhar festival entitled ‘Meghemduramambram’ began at Jawahar Kala Kendra (JKK) yesterday. Lores of Radha and Krishna’s romance, separation and utter devotion were rendered through Rajasthani folk and classical songs. The live performance began with a classical music rendition by artist Pt. Dhananjay Moreshwar. The composition was inspired from artistic pieces written by well-known poet Surdas. Following this ‘Geet Govind’ inspired by the works of 12th-century Indian poet Jayadeva witnessed Rajasthani folk songs and classical music along with picture presentations in the background. ‘Geet Govind’ describes the relationship between Krishna, Radha and Gopis (female cow herders) of Vrindavana. The performance was directed and conceptualized by Pt. Alok Bhatt. He was accompanied by Mr. Brijesh Bhargav; Mr. Brajesh Vyas; Mr. Ankit Bhatt; Ms. Ridhima Pareek; Ms. Giti Bhatt and Ms. Deepali Sharma on vocals. On table were Mr. Mahendra Shankar Dangi and Mr. Rishi Sharma; Mr. Priyank Krishan on Flute; Mr. Sanjeev Sharma on violin; Ustad Anwar Hussain on Santoor and Mr. Ashish Bhatt on Percussion.